Multi-Source audio systems allow sourcing multiple input sources (i.e. tuner, CD, DVD) to each audio zone independently. The music choice for a listening zone may be one of two, three or four different input sources. 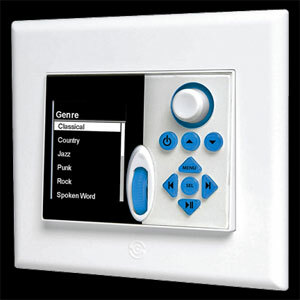 Audio control keypads are located in each listening zone for controlling on/off, volume, input selection and mute. Having the ability to listen to different audio programming upstairs and downstairs or in different rooms is a feature that is appreciated in families with a variety of listening tastes. The most cost effective one-stop solution available today, with 12 channels of 30 watt, state of the art, digital amplification for efficiency in a reasonably sized chassis. Cost effective in programming ease. The most powerful one-stop solution available today. Power in amplification ... 16 channels of 50 watt state of the art digital amplification for efficiency in small chassis. Power in tune flexibility... Two AM/FM tuners with a total of 80 presets allow each zone to have their own 10 presets.